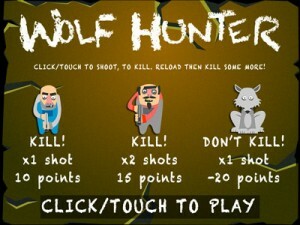 Wolf Hunter’ The hunter becomes the hunted in this take on ‘whack a mole’. Load and reload your shotgun and touch/click the hunters as they emerge from behind the cover. The blue hunter takes one shot and the red hunter takes two shots to kill. They could appear from behind any cover and the games speed will gradually increase to a chaotic crescendo, the aim is to get the maximum score before the game ends. Be careful not to hit the Wolf. 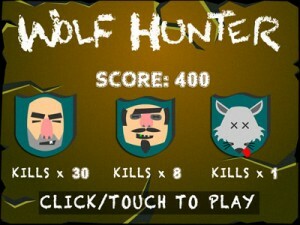 The wolves can only take one hit and will rapidly deplete your score. The game can easily be customised to suit your requirements. The game is developed with Phaser desktop and mobile HTML5 framework (http://phaser.io/) and is available for sale on codecanyon. This entry was posted in ANDROID, Android Games, Game Template, HTML5, HTML5 Games, iPad Games, iPhone Games, PHASER and tagged cross browser game, game template, HTML5, Phaser, shooting game. Bookmark the permalink.